Here’s a quick update on what’s coming up for EQ2. EverQuest 2 is best with friends, and in August we’re working on bringing players from different servers together! Our engineers have continued with database work that will allow not only cross-server dungeons and true cross-server battlegrounds, but also server consolidation. It’s a very complicated process, but we are targeting the end of August for US Servers to start testing at the very least. EU, Japan, and Russian servers will come a bit later as we identify how to best handle language/client integration. This code touches the fundamentals of how we handle characters so we have to be diligent on this one. Note that I wrote, “server consolidation.” That’s not evasive language, but our approach. We think our best path is to consolidate some lower population servers into a new server and build a brand new server community from those players. Those players moving will get a title naming their original server that can be worn with pride! And we will run a vote for the servers being consolidated to choose a new name for the new server based on the recent submissions we’ve had. We don’t know which servers yet, but that’s our next task. We haven’t stopped working on it! When we get into the fall timeframe, we’ll start talking about the details. And we can’t wait! Prelude events for the campaign will start as early as September! Vote on Bug Prioritization at dgcissuetracker.com! We really encourage you to join and submit bugs to dgcissuetracker.com and we will prioritize our by your votes. If you want to help moderate and verify bugs, you can apply on the site. As busy as we are, I can tell you the entire team always spends a portion of their week working on Live issues or bug fixes. That’s how we rumble and that’s the reason for our weekly updates! Help us focus on what matters to you! The Community Round Table (CRT) is a group of players that dev talks to directly to get feedback and help us make informed decisions about what players want from EverQuest 2! In the next week or so, Kyle “Kander” Vallee will be ramping up the CRT with a lot of new applicants! We are very excited about getting some discussions going about the future of Norrath in EQ2. The Guide program has been growing lately as we expand their role. They will be on hand to support issues on live servers and will be reporting back to us so we can help. They are making a real difference on EQ servers and we are thrilled to get the same support for EQ2 starting with the new TLEs to help along some new and returning players. We’ve got a few things up our sleeve from now until the end of the year. We love this game and our community, truly, and we are committed to a bright future. 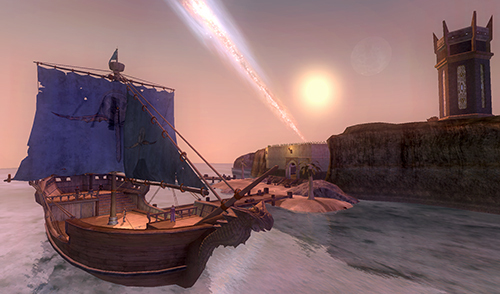 Speaking of love, we were giddy over the surprised and emotional reactions from players on TLEs when they logged in to discover the Far Journey ship and Isle of Refuge zones. We really wanted you — our players — to discover that on your own and share the joy with each other. In that spirit of gaming (i.e. fun), we are going to experiment with a few ideas as we move along and see what you think. We know you’ll share your thoughts with us! As always, we’re grateful for your continued support! That’s certainly what Ry made it sound like, but I’m not quite sure that’s what he actually meant. Hoping they clarify his comments better today. Mmmmm I likes surprises, sounds like theres some interesting stuff on the horizon. Hope they’re still working on revamping PQ’s behind the scenes, the subject seems to have gone off the radar since late last year, and with all the upheavals this year I hope it is something that’s still on the cards. They are infact friend of mine and I on the TLE PVE server helped kandor get a handle on the Antoinca PQ bug. I would also like to see the promised revamped deity system. Not just being able to worship multiple deities, but taking a closer look at current miracles and blessings. So guilds that have been worked hard on to level..gone. Possibility of losing your name.. I really hope I’m reading that wrong,…. I’m happy where I am and have no desire to lose my guild. It would cause me to just finally give up after all this time.